This bracelet is simple to make and requires no pattern; just the simple instructions that are written below the photo. The half bracelet finding is 3” in length on the inside curve. The opening where the braid is glued into the finding is 8mm. (.25”) of unbeaded braid at both ends to glue into the finding. You will not pick up any length with the loop as it closes over the finding. 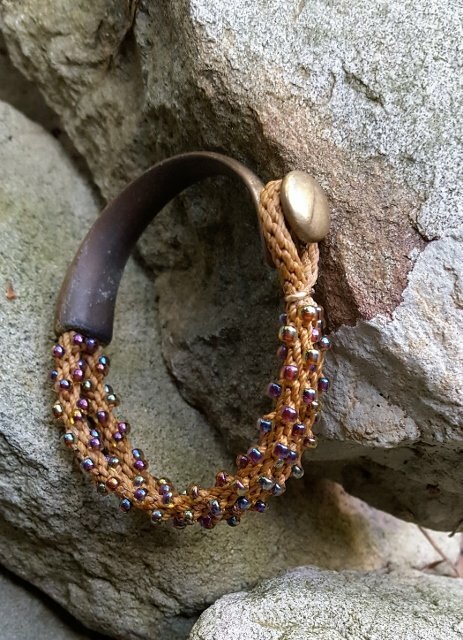 The beaded portion of the braid (mine has beads on just one warp but it can be fully beaded if you prefer) is the desired length of your finished bracelet – 3”. Here's the braid for a 7” bracelet: ¼” with no beads, 4” with beads, 2” with no beads, 4” with beads, and ¼” with no beads. 10 ½” of braid total. Fold the braid to make the loop toggle and close the loop with a piece of 18 or 20 ga wire. Then glue the ends into the finding. Tip: if you're making a fully beaded braid (which may take up more room on the wrist) you may want to add ¼ – ½ “ of length to the two beaded sections.